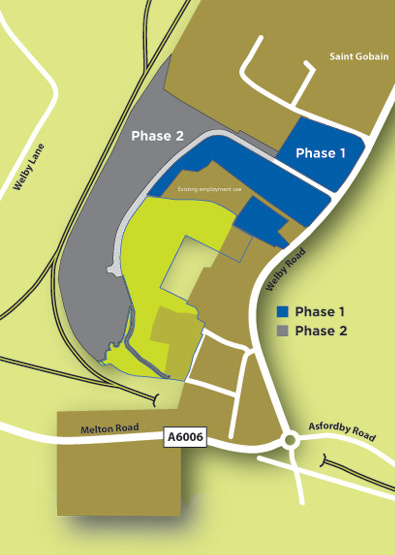 Serviced plots can be created from ½ to 20 acres and the site has planning consent for B1, B2 and B8 uses. Rotherhill can also design and build completed turnkey buildings on either a freehold or leasehold basis. Whether you want an office, warehouse or industrial building Rotherhill offers a free bespoke fit out and space planning service so you can create exactly the building you require. MMBP is conveniently located on the edge of Melton Mowbray, close to the route of a proposed bypass and well connected to local and regional transport links. A dis-used rail track to the north of the site could provide future rail connectivity. Nearby industries include UK coals Asfordby site and St Gobain and Melton Mowbray provides a good labour supply.